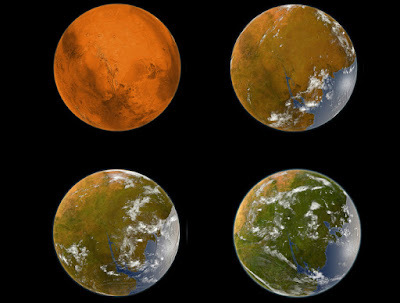 Mars has water on its surface, and it's in liquid form at least some of the time. NASA on Monday announced the results of a new study showing that salty liquid water flows seasonally on Mars, giving the red planet one of the essential ingredients for life. The study, published online by Nature Geoscience, focuses on the mysterious recurring slope lineae, or "RSL" -- narrow, streaky features on the planet's surface spotted by NASA’s Mars Reconnaissance Orbiter spacecraft. The RSL are typically about 15 feet in width or smaller, and appear on slopes during the planet's warm seasons. They fade during cooler seasons, then reappear the following year as the planet gets warmer again. While NASA has suspected that the RSL are made of salty brine, previous analyses of data from the spacecraft's Compact Reconnaissance Imaging Spectrometer have found neither salt nor water. Patsy in White Pines, Tennessee called to talk about an encounter she had with a praying mantis being in Kentucky. Check Out the Hang Time! 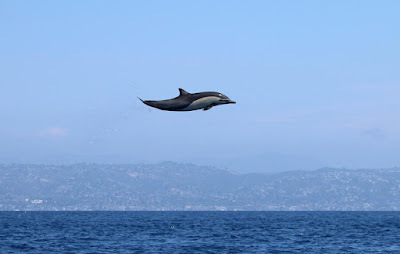 The marine mammals are known to put on a show with their high-flying acrobatics, but this short-beaked common dolphin got some serious air about 4 miles off the Laguna Beach coastline on Tuesday. 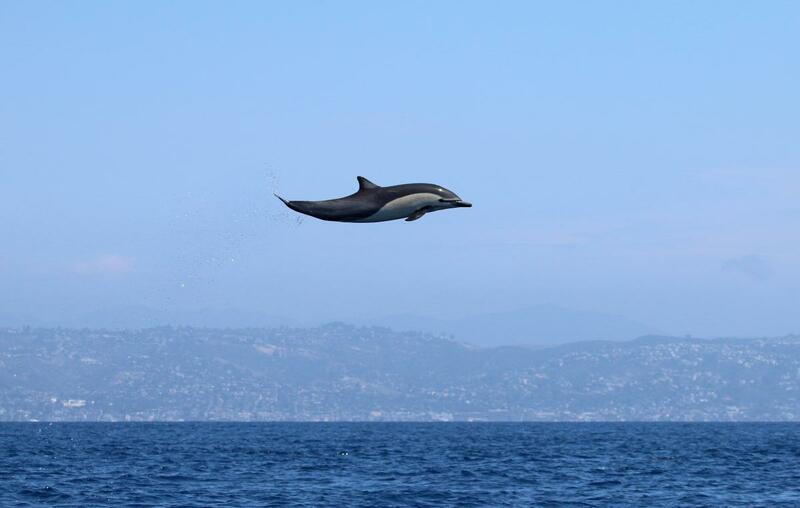 Newport Coastal Adventure owner Ryan Lawler captured the leaping dolphin as it soared into the air. Lawler said the acrobatics are not just for show. The dolphins crash down on top of fish they are preying on to stun them. He estimated that the dolphin he saw got about 20 feet into the air. "It's not something we see every day," he said. "It was pretty spectacular, it was a lot of fun for our guests." It was built in Los Angeles, US, in 1931 as a luxury yacht for movie director Roland West. Naming it Joyita, meaning "little jewel" in Spanish, for his actress wife Jewel Carmenille, the 69-feet long wooden ship changed hands in 1936. It was said to have been acquired by the US Navy in October 1941, taken to Pearl Harbour and outfitted as a patrol boat. The Joyita ran aground in 1943 and was heavily damaged but since ships were needed by the navy, she was fixed. It changed hands in 1948, then again in 1950 and in 1952 when Dr Katharine Luomala, a professor at University of Hawaii bought it. She chartered the ship to her friend, Captain Thomas H "Dusty" Miller, a British-born sailor living in Samoa. Miller used the ship as a trading and fishing charter boat until the mysterious incident surrounding it three years later. THERE are some ghost ships in the world but this particular one is known as the Pacific's ghost ship. It is listed as one of the 10 ghost ships in the world by some websites because of the mysterious circumstances in which it was found. Although there are many stories on what may have happened on board, no one knows until today what really transpired on the ship. The disappearance of 16 crew members and nine passengers who were on board the ship remains a mystery so far. It was about 5am on October 3, 1955 when the Joyita is said to have left Apia in Samoa for the Tokelau Islands, which is about 430 kilometres away. According to Wikipedia, the ship was scheduled to leave on the moon tide the previous day but her departure was delayed because her port engine clutch failed. The ship eventually left Samoa on one engine with the crew and passengers, who included a government official, a doctor, a copra buyer and two children. Her cargo is said to have consisted of medical supplies, timber, 80 empty 200 litre oil drums and food items. The voyage was expected to take between 41 and 48 hours and the ship was scheduled to arrive in Tokelau Islands on October 5. On October 6, Tokelau Islands reported that the ship was overdue and no ships or aircraft had reported receiving a distress signal from the ship's crew. A search and rescue mission was launched and from October 6 to 12, a Royal New Zealand Air Force plane covered about 100,000 square miles of ocean during the search. But there was no sign of the Joyita or any of her crew members or passengers in the area that was searched. On November 10, 1955, the merchant ship Tuvalu was going from Suva to Funafuti when its captain sighted the Joyita more than 1000 kilometres west from her scheduled route, drifting north of Vanua Levu. The ship was partially submerged and listing heavily, there was no trace of the passengers or crew and four tonnes of cargo is also said to have been missing. According to the Wikipedia, the Joyita carried a dinghy and three life rafts but all were missing and there were other damage to the ship. The electric clocks on board reportedly stopped at 10:25 and the switches for the cabin lighting and navigation lights were on, implying that whatever had occurred happened at night. The ship's logbook, sextant, mechanical chronometer and other navigational equipment as well as the firearms its captain Dusty Miller kept on board were missing. A doctor's bag was said to have been found on deck containing a stethoscope, a scalpel and four lengths of blood-stained bandages. An inquiry that was carried out was only able to establish the reasons for the vessel becoming flooded, the condition in which it was found. 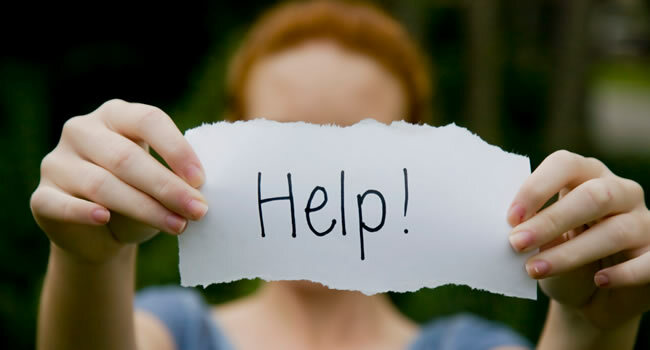 Numerous theories on the disappearance of the Joyita circulated then and even afterwards but no one has been able to determine what actually happened. A few days after the ship was found, The Fiji Times quoted a source as saying that the ship had passed through a fleet of Japanese fishing boats and saw something they should not have seen. The other theory was that pirates had attacked the ship, killed its crew and passengers and stole the four tonnes of cargo. In July 1956, the ship was auctioned off by her owners to a Fiji islander, David Simpson, who refitted and overhauled her and went to sea again that year. She ran aground in the Koro Sea in January 1957 while carrying 13 passengers. She was repaired and she began a regular trade between Levuka and Suva. The ship ran aground on a reef again at Vatuvalu in November 1959 and floated off during high tide. It was sold to a Robin Maugham in the early 1960s and he also wrote the book, The Joyita Mystery in 1962. Mr Maugham is said to have sold the hulk in 1966 to a Major J. Casling-Cottle who ran a tourist and publicity bureau in Levuka. The hulk is said to have disappeared piece by piece and the process of disintegration reportedly appears to have completed in the late 1970s. On June 22, 2009, this newspaper reported that Captain Lawrence McCaig had turned up at The Fiji Times office with photos of the salvage operation and the Joyita's sextant. His father, Captain Robert McCaig had captained the Degei Number 1 which salvaged the Joyita and towed her back to Suva. Mr McCaig had said that there were many stories about what might have happened to the ship but three remained constant over the years. He said these were that there was a feud with the ship's captain, that there was a dispute among the crew and that those onboard had been taken by pirates. Some people have also commented on the Joyita mystery on the website www.godlikeproductions.com but so far no one has been able to determine what happened to the crew and passengers onboard. Like the stories of other ghost ships in the world, what happened to the Joyita remains a mystery to this very day and is still talked about in some circles. There was no real reason for them to have abandoned her. she went derelict for years and slowly disintegrated. I don't know for sure if she was dragged off that reef or relocated nearby but she clever sailed again after that final grounding.